The Omron ultra silent 7 Series® wrist blood pressure monitor is slim and more discrete for readings anywhere you go. #1 doctor and pharmacist recommended brand and the #1 selling manufacturer of blood pressure monitors for 40 years. UltraSilent inflation is quick and so quiet that measurements can be taken anywhere, anytime, and even more discretely. Heart Zone guidance feature helps ensure consistently accurate readings. 100 Memory storage with date and time stamp allows you to review readings with the touch of a button. Tested and validated for accuracy the same as all Omron upper arm blood pressure monitors. 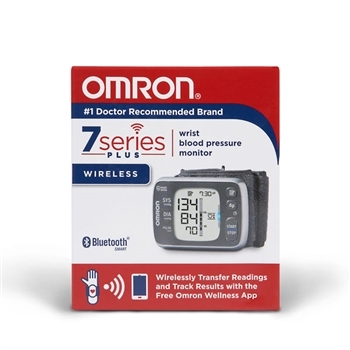 The Omron ultra silent 7 Series® wrist blood pressure monitor (BP652N) is slim and more discrete for readings anywhere you go. It features ultra silent inflation so measurements can be taken quietly, anywhere, anytime, and also features the Heart Zone Guidance technology, which helps to guide your wrist to heart level, making it easier to find the correct position for a precise reading every time. The 7 Series wrist monitor also automatically averages your last 3 readings over a period of 10 minutes for a more accurate picture of your heart’s health. 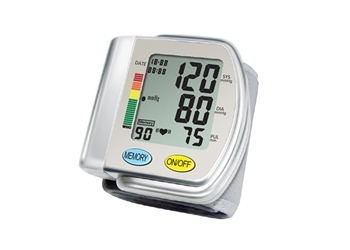 This Omron 7 Series wrist blood pressure monitor also stores up to 100 readings allowing you to keep a comprehensive recording of your readings over time to monitor any fluctuations in your readings. 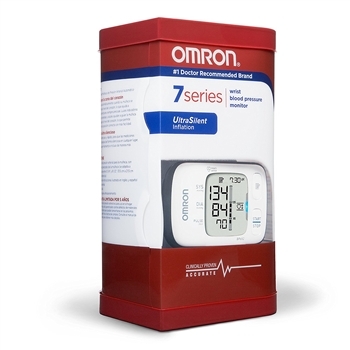 Omron blood pressure monitors are a #1 doctor and pharmacist recommended brand for home blood pressure monitoring. When you trust your heart health to Omron, you’ll be empowered by accuracy. Very accurate. Shows a blue light when your arm/hand is the correct position to get a reading. It is easy to use and it is fast and quiet!! I have used it less than a week. It is working great. I like it very much and Concord got it here in two days. I'm happy. I like the ease and functionality of this blood pressure monitor. My arm usually bruises from regular above-elbow cuffs, but there is no problem with the wrist cuff. Just used first time. like it.